Description: Native to Mexico and Central America and deriving from the same family as melons, cucumbers and squas, chayote is known for its green coloring and mild taste. Usually cooked lightly to retain the crisp flavor and rarely eaten raw, chayote is usually prepared with light seasoning to add flavor. While typically the fruit is the eaten part the root, stem, seeds and leaves of chayote are all edible and very healthy. The fruit itself is pear shaped and green in color and it is often used in children's foods, juices, sauces and even pasta dishes. In India, it is not only used as a food but as fodder and in some areas the stems are even used in the manufacturing of baskets and hats. . 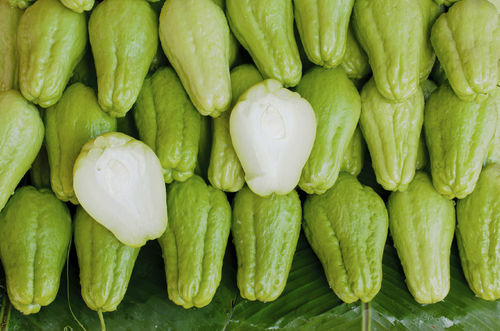 Kitchen Pharmacy: Chayote is a very hpertension.ealthy vegetable and has been used as a diuretic, an anti-inflammatory, and has even shown to be beneficial to cardiovascular health. A tea can be made from its leaves and has been used to help dissolve kidney stones and treat arteriosclerosis and hypertension.